During a Government Shutdown, only those government services that scream the loudest will get a temporary stop-gap measure. The Media should investigate why this certain government service is needed and also explain "how" many tax payer dollars are needed. (3) what it really takes to get the job done, right and on time. (A) if it should be streamlined. (B) And if the gov't employees don't drag their feet via wasteful "process-is-your-friend" greedy mindset enforced by senior federal employees. (C) Or, if that gov't service should be sub-contracted out. (D) Or, the gov't service should be eliminated all together. We can also "follow the money" on which senior gov't employees are contributing to who. (Maybe all senior gov't employees should all be audited and have a limit on the total number of years on the gov't payroll regardless of what position they have in the past). With each Media News report, the President and Congress can look closely and decide if that gov't service and its senior "drain-the-swamp" employees need to be funded and how much tax payer money they get and how much have they gotten in the past and relative and absolute increases in their budget. 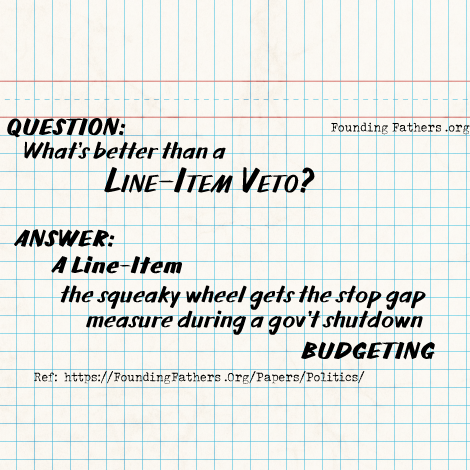 If The Left says no to this type of "squeaky wheel gets the stop-gap measure" budgeting (and want a massive take or leave it, all-in-one deal), then they clearly are to blame for that specific gov't service being shut down. And if it takes months (or years) of this combination of a Gov't Shutdown + Line Item Squeaky-Wheel-Gets-the-Stop-Gap-Measure Budgeting, then so be it, as America is Trillions in debt and the Federal Gov't has nothing to show for its spending except more Poverty, Crime and Higher Requests for Taxes. #1 - As an example of how this would work, one can take a look at trash piling up at national parks. If this is a problem, the President can send outside officials to look at this. Ask around if this true and if someone is in reality, dragging their feet in picking up trash. E.g. Is this already sub-contracted out? Or, can this be sub-contracted out in a specific stop-gap measure for a certain number of months? Next, if this is sub-contracted out, one can ask how much is already being paid to federal workers to pick up and dump trash and pay according (or put a request for bid) to sub-contract out. #2 - Another example is a TSA worker who has a home mortgage to pay. Can that TSA worker be moved to another funded government position at the same location? Can that TSA worker also pick up trash, clean windows, etc.? Or maybe that specific location and work shift can be temporarily funded with a stop-gap measure? #3 - The same can go for the Military and also the VA systems and the Health Care, Education, and Housing Departments. First, EBT should be eliminated. And Paper Food Stamps should be used to so that "The Village" can raise the child via offering those using Food Stamps at groceries a job if they see them using a paper Food Stamp. Secret shame of being on Welfare? Ha! This can signed as needed. Also, the President and Congress can check and see if each state and hot spot locations are transitioning The Poor to work. WHY SHOULDN'T THERE BE A GOVERNMENT SHUTDOWN? If you look at the increase in government spending since say the year 1900, you will a constant increase. Yet since the 1960's, the year of Liberalism, the Government has nothing to show for all their spending.